Last Friday I did two things I’ve never done before, I went on a little trip just to buy yarn, and I met some people whom I only knew through there blogs before. I have an excuse though. A) I don’t get out much, and b) it was Wollmeise-yarn. 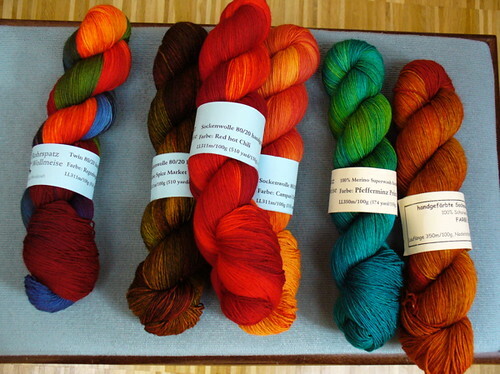 Claudia, the Wollmeise, has become increasingly famous for her beautiful, colorful hand-dyed yarn. When she updates her online shops these days, it takes about 30 seconds for everything to become sold out again. So when I heard that she would be at a market nearby I immediately decided to go. Since I didn’t know the place where the market was supposed to be, at first I thought we’d have to take the car and make a family day trip out of it but further research showed me that getting there was actually quite easy. I only had to get on the train that passes the nearest train station and stay in there for about 50 minutes. Then I found out through ravelry, the knitting and crochet community, that of course there were a lot of people planning to go there, and i figured it’d be best to go there right when the market opened. So I dropped off my son at kindergarten, for once wearing makeup and carrying my enormous purse with my knitting and something to read and such, and got on the train. I had posted on ravelry which train I planned taking and there had been a couple of other people saying they would be on the same train, so I sat in the first car, knitting, so that they could find me. That didn’t work out though. At one station suddenly the train was turned around. The first car became the last. Just before leaving the train though I spotted Elemmaciltur, Mrs. B, and needlegnome (That last one is link to a ravelry profile. You have to be a member to be able to see that but she doesn’t have a public blog.) We went to the market together. I’m not meeting many knitter in real life and so I found it quite refreshing to hear things like, “Is that the Kaffe Fasset-yarn in your scarf?”. Also it got me so confused that I answered yes before realizing that the Kaffe Fasset-yarn actually was in my purse instead of around my neck, and that probably nobody there possessed x-ray vision. I also did that confusing thing where I talk English a lot, and then with different people keep switching between English and German until I need a few seconds to answer to anything because I first have to make clear which language I’m currently hearing. The market was very nice but of course we made a beeline to the Wollmeise’s booth first. I had prayed beforehand that it would be a pleasurable experience for me, and it was. Though right after we arrived all hell broke lose. 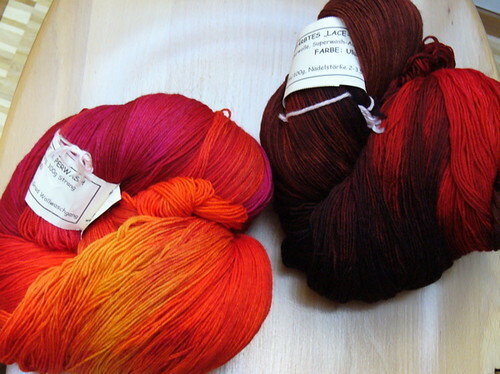 I went in with a vague idea of wanting about four skeins of sock yarn, preferable oranges and reds with at least one skein of something turquoise like Pfefferminz Prinz for my husband, and at best two skeins of lace yarn, preferable something earthy, and something orange or red. When I went in the lace yarn was invisible under all the people so I just grabbed one delightful skein of sock yarn after the other, then when there was a slight opening at the lace yarn basket, dived in, pulled out the two reddest skeins I saw, decided that I didn’t like the other colors that much, found a salesperson, paid, and waited in front of the booth, the paper bag with my yarn firmly clasped to my bosom until everybody else was finished. I had ample opportunity to see that not all shoppers are as decisive as me. I saw one woman agonizing over a skein of lace yarn for about half an hour. She put it next to herself and looked in the mirror, she asked a friend and two other people for advice, she thought about whether it would be enough or not… I saw people going in there with a list as long as my arm, people who had to get something like 20 skeins for other people. I can tell you, I was very happy to be standing a bit apart from this. Well, I could have had a list too, you know, in fact I did have a list. I told one woman whom I met on ravelry that I would bring her something, if possible. She told me her favorite colors, and I was happy to have found something she’ll like. After that we wandered around the rest of the market, I bought a marble for my husband, had waffles, and then after hitting the booth a second time (not me) we went home. It was an interesting experience to meet people whose podcast I have been listening to and blogs I have been reading for months. Mrs. B started to tell me about the spinning wheel she borrowed and I already knew it. I felt a bit like a stalker. Especially since none of them reads my blog. I’d love to meet knitters more often but then I’m already doing too many things as it is. The only meetings I could manage to attend would be on Sundays and that’s family time. The very best thing for me though was that I found out that there is such a thing as enough talk about knitting (and spinning) for me. When I came home on Friday hungry and thirsty, and my husband had prepared a lovely meal, and I then started to teach again I was so happy to making music again! I had feared that my longing for knitter talk were bottomless. With the people I know I usually talk about knitting until their eyes start to glaze over and then I try to stop. But there I met people who are willing to talk about fiber and such for hours on end without getting tired of it. And that eventually I was ready to talk about other things again. You know, like other people. It is great to find friends that fit your interests… it makes life that much more pleasurable. How lovely that you got to step out and enjoy the yarns, the knitters and come home to a cooked meal. you met fellow bloggers and shopped for yarn. and i read this and think how terrific that sounds and how i wish i could have had some waffles too.